Avocados seem to be my latest passion. I buy them by the dozen and then put them in everything. Wraps, salads and now pasta dishes. Although some people may be afraid of them because they do have quite a bit of fat, but that doesn’t mean they are bad for you. Quite the opposite. Avocados are great for you and they have healthy fats, called monounsaturated fat which reduces levels of bad cholesterol in your blood and lowers your risk of stroke and heart diseases. If that didn’t convince you, they also have quite a bit of protein, very low sugar and are an excellent source of potassium. But my favorite part of all, 1 medium avocado contains 11 grams of fiber, can you believe that? That’s almost half of the daily recommended minimum intake. So I say one avocado a day keeps the doctor away. But why stop there? 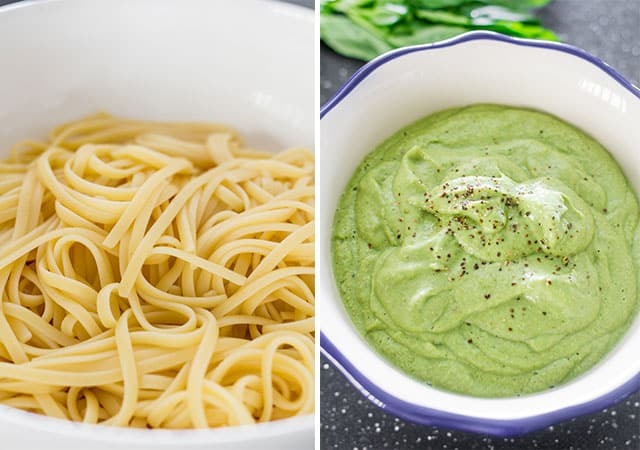 To make this creamy avocado sauce even healthier for you I added a bunch of spinach. Now we all know the health benefits of spinach, it has high nutritional value and very rich in antioxidants. But spinach doesn’t stop there. 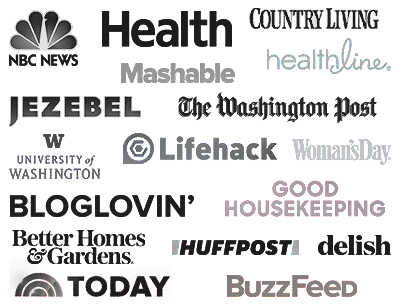 I was just reading about this recently and there have been multiple studies that show that spinach helps combat many cancers, helps boost eye health and has strong anti-ageing properties. I can go on and on and talk about the benefits of avocados and spinach, but why bother. All you need to know is that not only is this sauce good for you, it tastes freaking amazing. It’s like a pesto almost because I added some pecans and a bit of Parmesan cheese too, but no oil whatsoever because you don’t need it. You get all the creaminess from that great avocado. This sauce should be bottled and sold, it’s money. I have to think of more ways to use this because it’s simply amazing. It’s crazy good. As I was eating this I was thinking I should feel guilty because here I am eating a bowl of creamy pasta, but I had to keep reminding myself that it’s good for me. But it felt so bad. But it was so good. To make this even better you could use gluten free pasta or whole wheat pasta, whatever you wish. I also love the bright green color of this sauce, it’s so purrty. I just love the color green in my food. It looks healthy. It is healthy. Of course if you were to skip the spinach, you might not get that bright green color, so the spinach definitely helps. The best thing about this pasta dish is that the only cooking required is for you to boil the pasta. The rest, my friends, no cooking required. All you need is a blender and a bowl. Needless to say it’s all gone and now writing this post and looking at these pictures I wish that I still had a bowl of this so I can stuff my face with it. It’s a bowl of health. Totally delish and super good for you. 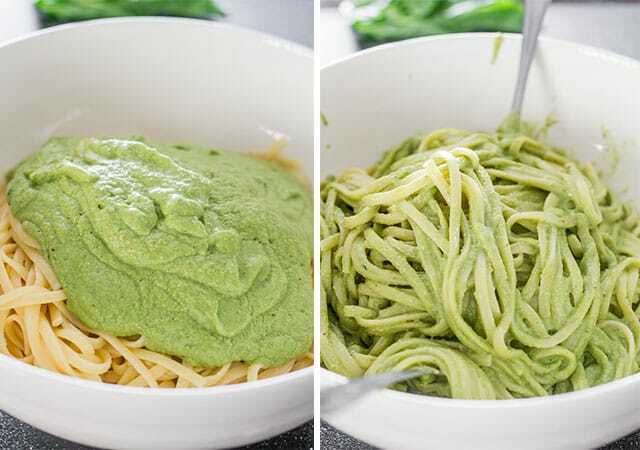 Store leftovers in an airtight container in the fridge for 1 day, but keep in mind that because of the avocado pesto, it will change color and might turn brownish. Yes you can, but you will need some sort of nuts in this sauce. You can use pine nuts, walnuts, pistachios or almonds. 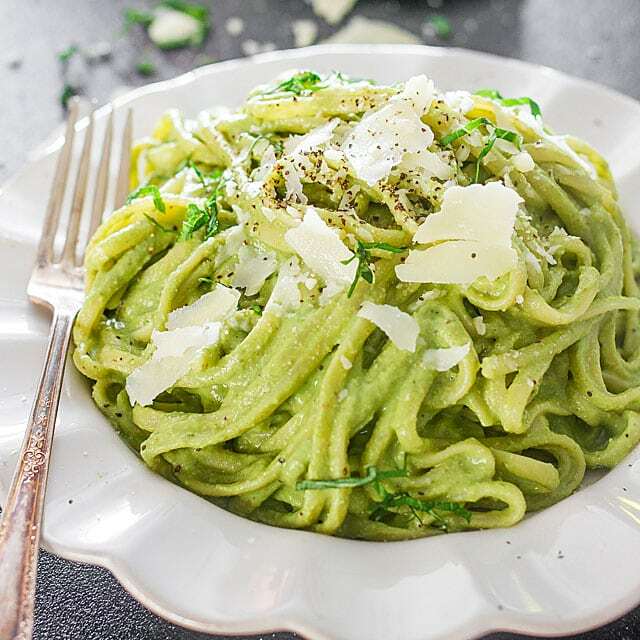 Another similar pasta you can try is this Arugula and Walnut Pesto Pasta. 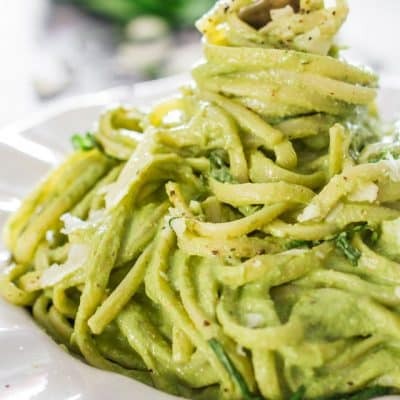 Creamy Avocado and Spinach Pasta - a creamy sauce made with avocados, spinach, basil and pecans. A super healthy and delicious pasta dish, eat without guilt. Cook pasta: Cook the pasta according to the package instructions. Make the avocado sauce: Add the rest of the ingredients to your blender and blend until it turns into a smooth sauce. Start with 3/4 cup of pasta water and add more as needed to get the consistency you want. Assemble: Toss the pasta with the sauce in a bowl and serve immediately. This sauce is best served the day it is made, as it uses avocados which will turn a brownish color. 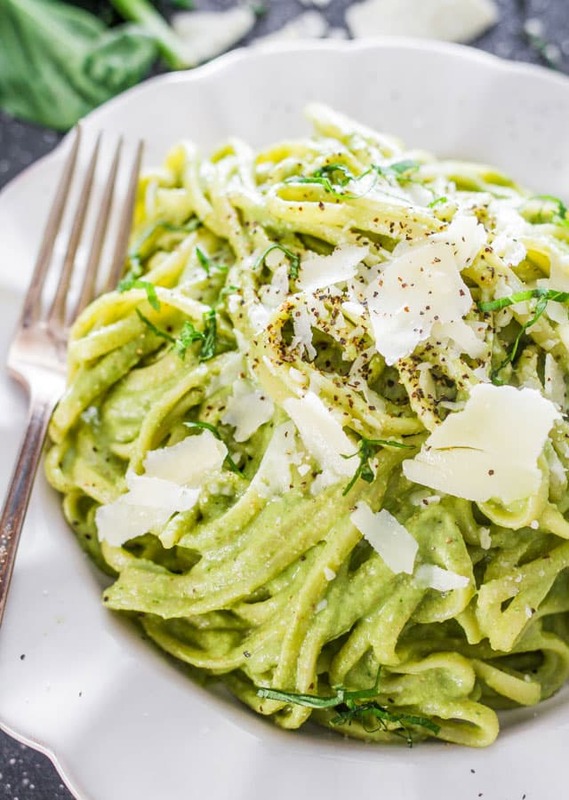 How do I store leftovers: Store leftovers in an airtight container in the fridge for 1 day, but keep in mind that because of the avocado pesto, it will change color and might turn brownish. Can I use any other types of nuts: Yes you can, but you will need some sort of nuts in this sauce. You can use pine nuts, walnuts, pistachios or almonds. Can I add chicken to this: Yes, for sure. Adding some cooked chicken would be a great protein to add to this dish. Great recipe. I tried just as is, simply added Parmesan and salt to taste. Maybe I didn’t add quite enough pasta water, because I was lazy to catch enough as I drained it over the sink with a drive, but damn it was good. I don’t normally go for super healthy vegetarian type stuff but I would definitely make this again. And you’re right, the colour is amazing. Tip: Shepard avocados don’t go brown as quickly as other varieties. After two days in the fridge my sauce was still green, just a tad darker. I wish we had that variety available here! That would be nice.I usually collect pasta water while everything is still in the pot. Very carefully sink a mug or measuring cup on its side to fill with the water. Do nuts have to be added? I have a nut allergy but I would love to try this recipe! Is there any way to replace it or can I just leave it out completely ? You can leave them out completely! Awesome dish Because of the simplicity, I didn’t think about it for company but it will be a company dish in addition to family dish. Also, leftovers won’t turn brown if you cover it fully in plastic wrap before putting the cover on the air tight container. You can also spritz some lemon juice over the leftovers to prevent browning, adds some nice flavor as well! I just want to say i did love this dish. But the recipe was a bit hard to follow. 1/4 cup of Whole basil or chopped, or sliced? Same with the spinach and pecans? A 1/2 cup yields different amounts depending on what kind. I only had partially dried basil and a 1/4 of cup of that would have been ALOT of basil so i halved it. I used halves of pecans but using pieces wouldve resulted in a finer sauce. Love this dish! Here are a few changes I made: walnuts instead of pecans, because I had them at home, nutritional yeast in place of cheese to keep the sauce vegan. It turned out great! I put it on soybean spaghetti and paired it with tomatoes and Coke’s soaked in vinaigrette!! If you hover your mouse cursor over the number of servings in the recipe card, you can adjust the recipe to suit what you need. Use 1 tbsp of dried basil! I am definitely going to try this. But at first glance, my thought was, I wonder if adding one shredded apple to this recipe would make it even better? I would appreciate your thoughts. If you would kindly take a moment to email me. I think that would be fantastic, I love a little pop of sweetness! Let us know how it turns out. My pleasure! Let me know how they turn out for you! I use a vitamin c tablet to keep the avocado from turning brown. I made this tonight and was unsure about it, but wow was it good! I’m goi g to share this recipe with everyone I know. Not only is it healthy but it is delicious too. I had to have seconds. I highly recommend. Thanks for sharing it! 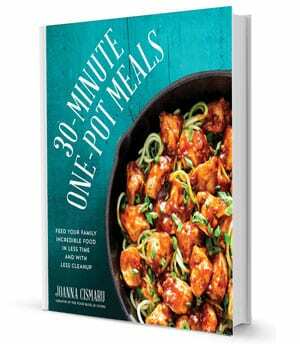 Delicious and super quick and easy! Hey. Great recipe, i made this once before. I want to cook this today, but the only avocado i have, is a slightly unripe one. Is that okay to use for this recipe? You’ll want a nice and ripe avocado for this recipe or else the sauce will come out chunky. Most grocery stores will have a section with their already ripe avocados, or you can just leave yours on the counter for a day. 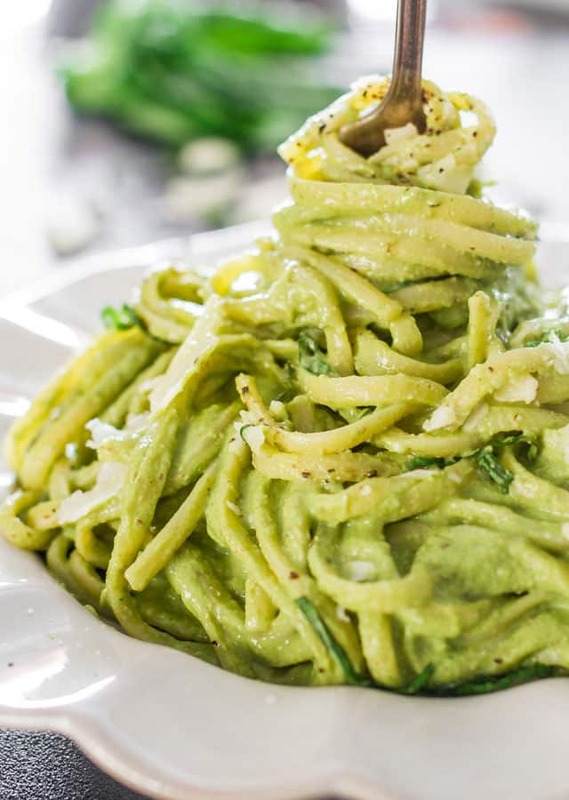 I love avocado, I love pesto, and I love pasta, so I knew this dish would be a winner! Made it with whole wheat spaghetti and subbed pistachios for the pecans because that’s what I had. I also used about 14 ounces of pasta instead of 10; there was plenty of sauce to coat it still (my avocado was big) and I have a serving’s worth of leftovers. It was tasty, although a little bland. We ended up squeezing more lemon over it and topping with parmesan. I would totally make again, though – came together quickly and was delicious. Made it to the recipe and it was delicious! The ingredients as written work brilliantly! The spinach (which I like) isn’t even noticed except as part of the flavor. As is our habit, while exclaiming how good it was, talked about how we could tweak it. Oven-roasted grape tomatoes and browned chicken, a little more garlic. Otherwise, we couldn’t stop stuffing our faces with this!